The health benefits of broth made with bones have been researched and documented for hundreds of years. Around 1150, Benedictine Abbess and scholar Hildegarde von Bingen recommended in her Physica (medical text) that “frequent and adequate” portions of broth made with calves’ feet was good for relieving joint pain. The Abbess was clearly on to something by recognizing the curative nature of bone broth. As it turns out, this ancient healing elixir has a number of other impressive health benefits that come from simmering animal bones for long periods of time. Read on for more about the health benefits of bone broth and tips on how to make bone broth at home. What’s in Bones That Makes Bone Broth So Good for You? When making (and consuming) bone broth, you benefit from 3 components of bones: gelatin (collagen), cartilage, and bone marrow. While gelatin is not a complete protein and cannot replace protein in the diet, it has been used historically as a protein stretcher. It contains the amino acids proline and glycine, both of which are two important amino acids that aren’t abundant in animal meats. The first large scale production of gelatin became possible in the late 1600s with the invention of the “digester” by Papin in 1682. This apparatus was a type of pressure cooker used for cooking bones or meat with steam. Just over 100 years later, Europe was embroiled in the Napoleonic wars and the French turned to gelatin as a way to stretch meager meat portions and feed soldiers as well as the legions of starving homeless living on the streets of Paris and other cities. More recent studies of gelatin have shown that it increases the digestion and utilization of other proteins such as meats, beans, milk, and milk products. Cartilage is primarily made from collagen and elastin proteins, but also contains glycosaminoglycans (GAGs), chondroitin sulfate, keratin sulfate, and hyaluronic acid. You might recognize chondroitin sulfate as a commonly used supplement for supporting joint health and mobility. It has also been shown to help improve inflammatory conditions of the gastrointestinal tract. Bones contain one of two types of marrow: yellow or red. Yellow marrow produces fat, cartilage, and bone and is found in the central portion of long bones. Red marrow is where red blood cells, white blood cells, and platelets are formed. It is found in flat bones such as the hip bone, sternum, skull, ribs, vertebrae, scapula, and the end of long bones. Red marrow is especially valued as it is where blood stem cells are formed. As such, it is an excellent source of nutritional and immune support. 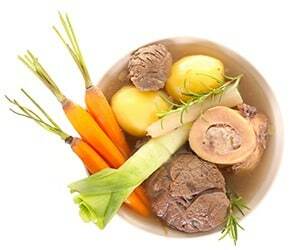 For example, a chicken carcass makes an excellent bone broth as it has a high concentration of red marrow bones. Improves gut health – bone marrow is easily digested and contains nutrients that help heal the digestive tract and improve nutrient absorption. Boosts the immune system – the strength of your immune system is linked to your gut health. Consuming bone marrow regularly helps strengthen the gut which will help to ward off illness and chronic disease. Glowing skin, hair, and nails – good health is usually reflected in strong, shiny hair and nails and in smooth, clear skin. Bone marrow contains gelatin (collagen) which is transferred into bone broth and into you when you consume it. Gelatin grows and strengthens hair and nails, and helps to smooth lines, wrinkles, and even cellulite. Reduces inflammation – One of the best ways to decrease inflammation is through a good diet. Eliminate or restrict inflammatory foods (i.e. vegetable oils, sugar, gluten, and GMO foods), and add the benefits of amino acids found in bone marrow: arginine, proline, and glycine. You can purchase raw bones from a butcher or use bones leftover from cooking. For example, if you make a bone-in roast, save the bone(s) to make bone broth. If you cook a chicken, save the carcass. If you don’t want want to make broth right away (or you don’t have enough bones), simply place the bones in a sealed freezer bag and store in the freezer until you’re ready. When it’s time to make broth, you don’t even need to defrost the bones first. When purchasing bones for making homemade bone broth, aim to get a variety of bone types which will ensure you’re getting marrow, cartilage, and gelatin in your broth. If you’re adventurous, you can try adding a couple of (well cleaned) chicken feet along with the bones which are an excellent source of collagen. For making beef or lamb bone broth, be sure to ask your butcher for both a joint bone and marrow bones. Your #1 consideration when making bone broth is the quality of the bones you use. Do your best to source the highest quality bones possible from pasture-raised/free-range animals that are grass fed and have not been subjected to antibiotics and growth hormones. You may have read about the need to roast bones first before making bone broth. Some people prefer this method as they find it adds extra flavor to the finished broth. Roasting is totally a taste preference and is not required. In any case, it is only for beef, lamb, or wild game bones – it is not a necessary step for bone broth made with poultry or fish. If you’re new to making bone broth it may be easier to skip the roasting step until you become more practiced with the process. If you do wish to roast the bones first, all you need to do is place the bones on a cookie sheet and roast uncovered in a 350F oven for 20-30 minutes. Once you’ve gathered your bones (either raw or roasted), you’re ready to proceed with the steps below. Step #1: Place bones (fresh, frozen, or roasted) into a large stock pot or crock pot and cover with cold filtered water. Make sure all the bones are covered, but still leave plenty of room for water to boil. Add coarsely chopped onion, carrots, and celery stalks to the pot. Step #2: Add two tablespoons of an acidic substance (eg. apple cider vinegar, wine, or lemon juice) to the water prior to cooking. The acid will help draw out important nutrients from the bones. Step #3: Heat slowly, gradually bringing to a boil and then reduce heat to a simmer. Skim off any scum that floats to the top. Step #4: Cook long and slow. Cook chicken bones for at least 6 to 24 hours (up to 48 hours). Beef bones can cook for 12 to 48 hours (and even up to 72 hours). A long and slow cooking time is necessary in order to fully extract the nutrients in and around the bones. You may need to add additional hot water as the broth simmers to keep the bones covered. Step #5: Add additional vegetables and/or seasonings such as sea salt, pepper, herbs and peeled garlic cloves to the pot 1-2 hours before finishing. (Optional) Add a bunch of fresh parsley 10-15 minutes before removing from heat. Step #6: Once broth is ready, remove from heat and allow broth to cool enough so you can handle the pot. Remove the solids, strain through a fine mesh strainer, and reserve the broth. If there was meat on the bones, you can pick this out to use in a soup. Step #7: Consume broth within 5-7 days or freeze for later use. Bone Broth can be safely frozen for several months. Using a crock pot that can be continually re-set for several hours at a time is likely a safer and easier option for most people. If you are using the stovetop method, be sure to keep an eye on your broth and follow good stove safety practices. After the broth cools, a protective layer of fat will harden on top. Only discard this layer when you are about to eat the broth. Alternatively, you may choose to consume it along with the broth. If your bones are from quality pastured animals, this is a healthy, nutrient-dense source of fat. Another option is to save this fat in a jar in the fridge and use it as a cooking oil when making other dishes. If your broth becomes thick and jelly-like – congratulations! That means it contains a significant amount of gelatin (collagen). When you heat up your broth, it will turn back into liquid form. To warm up your broth, scoop some into a saucepan and gently heat your broth on the stove, not in a microwave oven. This will retain the maximum possible nutrients. Season with salt & pepper and/or add other health-promoting spices such as turmeric, ginger, etc. There are many ways to use bone broth. It is delicious to drink by itself, or use it as a soup base, in sauces, and to replace the water when cooking rice, quinoa, or other grains. For even more ideas and tips on making and using healing bone broth, download this complimentary bone broth e-book from Organixx. For the easy way to get all the nutritional benefits of bone broth without all the work, check out our Bone Broth Protein Powder here – now USDA certified organic. Effects of oral administration of type II collagen on rheumatoid arthritis. Benefits of bone broth come from collagen, cartilage, and bone marrow. Collagen is useful for healing as well as digestion. Cartilage is considered beneficial in supporting inflammatory conditions. Benefits of bone marrow include gut health, immune support, and anti-inflammatory properties. It is important to select a variety of organic bones to reap maximum benefits. I have been doing this for some time now, sadly it did not help repair my cartilage in hips and I had to have an op but it could have helped delay the op by a few years.However it is great for keeping the skin young and supple and definitely well worth doing. I add it to soups and sauces, it doesn’t taste bad on its own either. Definitely will continue with this. Where on earth can we buy SAFE, hormone Free Bones? Definitely buy them at Whole Foods if they have them on the day you ask for them. But don’t bother leaving a “will call” order for the next shipment. You will never get a phone call. Now that Whole Foods has been sold to Amazon owner, Jeff Bezos, it is anyone’s guess what the new pricing structure will be and what quality all of the merchandise will be. What is the ratio for lbs of bones to volume of water. Want to maximize my yield. I bought an 18 quart Slow roaster with lift out container. Roast First for much better flavor. Put into roaster. I buy 15 or so pounds of marrow bones from local pasture raised cattle. Best Gel is to BARELY COVER with water all the bones. Too much water…less gel. More joints, neck etc more gel. I let mine go till the bones are clear through. Pick one bone out with pro silicone grips. Is it still pretty solid inside? Keep on slow roasting. I’ve let mine go for 3-4 FULL DAYS…all night as well. BEAUTY of the electric slow roaster. WASTE OF TIME to do such a small batch. I wait toward the END hours to add two full heads of garlic and lots of onions….I put a cheese cloth and CLAMP IT to the top of a 16 quart stock pot and wait a couple hours for a slight cooling down…..with PRECISION, I quickly pour through the cheese cloth. I fill quart containers (not glass) with the MEDICINE/FOOD then let it cool for a couple hours then into the FREEZER. I keep one quart in the frig for adding to whatever. FABULOUS. Thanks so much for these precise instructions! I really struggle with bone broth. It’s always an ordeal. I hardly ever get it to gel. :-/ How come your quart containers are not glass? Thank you for this recipe. I will definitely try it. I eat a plant based diet. How can I get enough protein? I do not eat animals or dairy products. Spirulina contains alot of protein. Beans and rice contain building blocks of protein so eating them at the same time is a centuries old practice. Do you eat eggs? Brewer’s yeast also contains alot of amino acids. Hemp seed! “Whole, hulled hemp seeds are about 33 percent protein and provide 11 g of protein per 3 tbsp. serving, or 30 g. The protein content of hemp seeds is higher than that of other nutritious seeds. Chia seeds contain about 4 g of protein per 30 g. Sesame seeds offer 5 g and pumpkin seeds offer 10 g.” This info comes from Livestrong.com but google “hemp seed” and you’ll be overwhelmed with positive facts! Good luck! PS: the ones without hull are more expensive and less nutritious, but they have the advantage of not getting stuck between your teeth. I grind organic whole seeds in a coffee-grinder until they are powder and then use them in smoothies. How many bones per regular sized crock pot? They are rather expensive at Whole Foods. And can you mix up the bones you save? Can they be already cooked? I have been making bone broth for decades, as I have been a “scratch” cook for fifty years. We love the flavour of the roasted bones, and find it to be a tasty hot drink all on its own. Thank you for the informative article. I have shared the love of home made soup broths and will pass this article on. Thank you for the Bone Broth book (e-book). We’ll download and print and try the recipes. Also will pass this along to my kids and their families. GREAT service — thank you !! Oh I would love this ebook as well please. Trying to deal with herniated discs and bulging disc. And osteoarthritis all in my back. I have made excellent bone broth using my crock pots. I have also begun using my Instant Pot pressure cooker to make broth, quickly. Does this broth have the same nutritional value as the slow cooker method? It takes time to cook out all of the health benefits of broth. I wish more of your articles could be in print form rather than downloads. I find it much easier to absorb, go back to, and read again than when in video format. Histamine intolerance reaction they shouldn’t do this. For some reason histamine intolerance is becoming widespread. Read Chris Kresser on histamine intolerance. Jerez, I’m wondering if that’s our problem. My son has been on strict GAPS diet with bone broth and he’s actually worsened. Dropped 10 pounds in a week on an already skeletal frame and sits with a box of tissues by his side as he eats the broth. Someone else said histamine reaction so I appreciate the reference. I noticed that your bone broth is made from chicken bones. I have a food sensitivity to chicken and eggs as well as many other foods. Is this okay for me, or should I just stick with beef and turkey bone broth? Please consult with your doctor about this before taking this product. Hi what are your thoughts on making bone broth in a pressure cooker, like an Instant Pot? Does it properly extract all of the nutrients being on high pressure? Or is low and slow the only way to go? Bone broth is regularly available in my household. The family feel deprived when it is not available. With buttered toast it makes an excellent lunch. Writing this makes my mouth water. We get a weekly supply of bones from the local fresh meat butcher who charges little for them. We try to use organically grown vegetables. Thankyou. Great recipe. You are my heros ! Shape to ride to work on clear days if you live within a few of the reasons they designed and built their scooter. A normal EB would consume fuel at an average rate of 100-150 watts of electrical energy compared to gasoline copnimstuon. I can´t print out you´r articles. The words and lines are laid on top of each other, so it´s impossible to read. what can I do? Have you tried to copy and paste the text from the article into a word document before printing it? Won’t the vegetables become Mushy if you cook them for that many hours? You strain the broth and toss out the veggies. Yes, they are definitely not attractive or edible. My dogs absolutely go nuts for the strained veggies after I make bone broth! They love it and I feel better not wasting anything! I filled out the request for the free bone broth book last night and your reply said it would come to my Email in a few minutes, but I still do not have it. Will you please try again. What is the benefit of roasting the bones compared to long slow stove pot cooking.Is it only flavour..if there is a benefit do you roast covered or uncovered, how long?. Then once roasted do you slow cook in water..for how long?? Can you use a pressure cooker to make the broth to cut down cooking time? Oh yes I do It. Saves nutrients too. What if you use a Stainless Steel Pressure Cooker (Fast Cooker Canner Pot Kitchen) ? Don’t you have the same result in 45minutes, rather than 48hours boiling ? I did not receive the e-book either. I did send in a ticket. Perhaps the book is no longer available. Sounds great but I am histamine sensitive so I guess this is not a good thing for me to do! I should say that I have experienced the benefits of drinking bone broth. I’ve been drinking Au Bon Broth and it actually helped me with my joint pains. I’ve been having less instances since I started drinking it 2 months ago. Do you drink it warm or cold? Through the day or at set times? Interested in adding this into my daily life. My doctor shared his bone broth recipe and told me it was important to make it with Hen and not chicken due to the the estrogen in hen’s. You can drain the liquid in mason jars and save in the freezer for future gravy use. This is an excellent soup base in the winter when you want to make soup of all kinds. I also add chopped turmeric roots, ginger and garlic in the soup. I’ll try this broth recipe next! I have always used bone broth for soups, but I did not know you should use some acid to get the nutrients out. In my country, we traditionally also add parsley root as it gives the broth a fine taste, not sure though how beneficial it would be when using broth for medicinal purposes. Some, who like a sweeter taste, also add celeriac. I guess this is more of a question – can you use parsley root and celeriac when making the “healing broth”. Also, I have often used the egg laying chicken (I guess they come from bigger industrial farms) for making chicken broth. Is this safe, or would it be better to use broiler chicken? I am sensitive to chicken and have been told to avoid it for 12 months. Does Organix Bone Broth contain chicken? Can I add chicken bones when making bone broth? Our bone broth protein is made with chicken bones. We would suggest that you talk with your medical professional about your sensitivities. I don’t see stevia mentioned in the recipe, so why do you put it in the powdered product that you sell? Not everyone likes for every g-d thing to be sweet. Having once taken a small taste of stevia, I will never eat or drink anything containing it. Haven’t found a dry bone broth product yet that doesn’t have it. Whoever makes the first one will have me as a customer. The plain bone broth protein doesn’t have any stevia in it! Ever since I started to make my own broth while at my wifes parents house (back in the Philippines), I’ve taken it back to the states over time. My mum has ever since got ahold of my recipe and has too… fallen in love with the taste. She is in her 50’s, experiences the biggest benefit. Has anyone tried doing bone broth from lamb and had a successful flavor? Pls send me your bone broth recipe. Can pork bones be used? Also, my joints ache whenever I eat beef, so I’m leary of consuming broth made with beef bones. Since I have high LDL levels, I have been avoiding animal products. What about bone broth? Not sure if I should stop drinking it? Thanks so much for the info on Bone Broth. With all the rushing around we forget to take the extra time to make a super healing soup. The Golden Rule is “We should be eating to nourish our body, and not just to fill our stomach.” Have a great day! You’re absolutely right, Gisele! Good nutrition is a vital component. Thanks for your comment! can i use presure cooker to make bone broth and use less time? We don’t see why not, Nika. Some of the steps might have to be modified, so please make sure to do your own research on how to make bone broth using a pressure cooker. Let us know how it turned out! My daughter is a vegetarian. I bought her the collagen but it has bones from animals in it. Do you gave a marine collagen? Hello Sandy. Unfortunately, we do not carry a marine collagen supplement. We thank you for the suggestion and will make sure to consider this kind of collagen for our manufacturing plans in the future. We do, however, carry some supplements that are not only vegan and vegetarian, but are also organic. You may check them out here: shop.organixx.com. We wish you and your daughter the best!